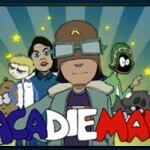 The next season of Acadieman will be broadcast on the CapAcadie.com website. Entitled Acadieman vs the 2009 World Acadian Congress, the season – when complete – will make up a full-length film featuring fictitious events surrounding the 2009 World Acadian Congress (WAC). Quebec separates… the Americans invade… and the Acadians are deported. Those are just some of the challenges to be faced by our Acadian superhero. The public are invited to the launch of Acadieman’s third season 7pm on Thursday, March 19, 2009, at théâtre l’Escaouette, 170 Botsford Street in Moncton, where four new clips will be aired. The Mézagouèche band will also be on hand to perform. “I’m putting together a 90-minute feature film, a story called Acadieman vs the 2009 WAC. The film will be divided into clips of about three minutes each that will be aired weekly on www.capacadie.com,” said Dano LeBlanc. This fall, the series will be broadcast on TV Rogers (the French-language arm of Rogers TV) over four episodes. The feature film will be released on DVD in time for the 2009 WAC. The series is a co-production of Capacadie.com, TV Rogers and the 2009 World Acadian Congress. “This is a great way of showcasing the strength of the new CapAcadie.com. Television is moving more and more toward the Internet. That’s why we launched CapTV. In December, we gave a quick preview of the series when we aired Acadieman vs Christmas. We were pleasantly surprised to have received nearly 30,000 viewings in three weeks,” said André Wilson, assistant manager of CapAcadie.com. TV Rogers, which aired the first two seasons of Acadieman, is pleased with this new partnership with CapAcadie and is very anxious to broadcast the third season in September. “TV Rogers has believed in this series since the beginning. The Acadieman series is a major hit for us. Once again, creator Dano LeBlanc has succeeded in developing a season filled with humour and surprise twists,” said David Richard, head of programming for TV Rogers. As Dano LeBlanc explained, the colourful “chiac-talking” character will travel all over. “The story is that Acadieman has been hired by the World Acadian Congress to recruit people from all over the world to visit the Acadian Peninsula in the summer of 2009. At the same time, Quebec separates from the rest of Canada. A wall has been built along the border of the new country. In fact, the “separatist wall” completely surrounds Quebec. At the moment of separation, the American army invades, something that greatly complicates things for Acadie. The results: a second deportation – but this one will be done in a more contemporary manner than the first one,” LeBlanc said. The Moncton artist likes to challenge himself before every season. “This year, I’m working with Eric Cormier, a new animator who’s using new software to develop the clips. This is why Acadieman, his mother, all his friends and even his cat Tigris look a bit different – a bit more modern for a more cinematic look. As well, we now have original music created by the band Mézagouèche made up of Claire LeBlanc and Daniel Fournier,” LeBlanc says. A few stars will be featured in the new series. One clip starring Quebec actress Pascale Bussières is already complete. Roland Gauvin will also make an appearance. As well, the Acadieman team created one of the clips with an eighth-grade class from Moncton’s École Le Mascaret as part of their Géniarts project. Several parts of the episode were written by the students, who also created various characters.